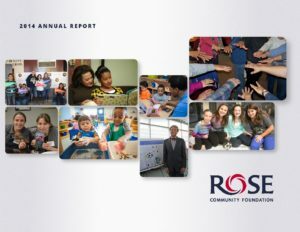 Rose Community Foundation set out on a plan for intentional growth in 2012. That plan was rooted in an important philosophy that our staff and Board of Trustees strongly supported – the more people and resources we involve in our work, the greater impact we will have in our communities. We focused on being more intentional about reaching out and connecting with others. We began to work more collaboratively with other funders, we started offering more ways for people to get involved in our work and we stepped up our services to help donors be more strategic about their philanthropic decisions. with you in this report.